MiniApps chatbots interact with millions of people around the world and combining them with the Ethereum blockchain is a unique value proposition for chatbot developers. MiniApps (https://www.miniapps.pro), a blockchain based platform for a new generation of chatbots, announced today the terms of the WINGS DAO (https://wings.ai) engagement for their upcoming token generation event in the beginning of October 2017. WINGS is an Ethereum-based platform that harnesses the wisdom of crowds for crowdfunding price discovery and for social promotion of projects to early adopters. Additionally, Miniapps will make use of the industry leading WINGS Promotion Management application for crypto-community engagement and early adopter growth. 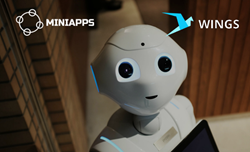 MiniApps is the new generation chatbot cloud platform built around the concept of decentralized network of developers, clients, hosting providers and partners, and a corresponding business model. With a set of ready-made business application templates, an omni-channel chatbot constructor, and Artificial Intelligence support MiniApps reduces the costs of chatbot adoption and support and enables millions of small business enterprises around the world to integrate advanced Communication and AI technologies into their processes and improve the quality of their customer service and other business functions. MiniApps serves about 10 million mobile users around the world, and sends about 1 billion messages monthly. More than 2000 development teams are registered with MiniApps. WINGS Bounty Management is the go-to promotion application used by several successful blockchain projects and well over 20,000 crypto-currency early adopters. It is the first of its kind automating bounty manager tasks to easily scale community building and engagement into the tens of thousands. To participate in the MiniApps bounty campaign before the token generation event goes live, head to https://bounty.miniapps.pro. Holders of WINGS tokens will be able to forecast the result of the upcoming MiniApps token generation event, and share their forecast with their social graph thus reaching a higher level of trust among early backers who can review sentiment by crowd aggregate or individuals in their social network. The Ethereum network gives an immutable, and 100% accountable track record of the token sale evaluation from a globally diverse group of crypto experts that comprise the WINGS community. Once the MiniApps token generation event ends WINGS forecasters will be rewarded based on their forecasts accuracy with 200,000 MAT (1% of the total token supply of 20 million MAT) and 1% of the Ether raised. WINGS token holders will be able to collect their algorithmically determined forecasting reward payment, based on the math model designed by Dr. Sergey Popov and Artem Gorbachev, PhD, by simply calling on a smart contract which will distribute their allotted tokens as well as adjust their publicly available WINGS Forecast Rating. The WINGS community will have the chance to evaluate and provide feedback on the MiniApp token at https://wings.ai in October 2017. Subscribe for the timely updates about the forthcoming token generation event at https://tokens.miniapps.pro.